The tests conducted by the popular YouTube channel PhoneBuff revealed that the iPhone X and the Galaxy Note 8 are very close in terms of performance, but Samsung's flagship managed to win thanks to its strong multitasking capabilities. Although such tests might not be enough to crown the king of the mobile realm once and for all, it is always interesting to see an iPhone facing a handset from the Android kingdom. Today, the battle is fought by the Apple iPhone X and Samsung's Galaxy Note 8. While we might have a winner, the results are tight, so it will be interesting to see them fight this battle once again after each of them gets a few software updates. For now, we should say that the test has been conducted by PhoneBuff, a popular YouTube channel that has almost 850,000 subscribers and has been quite busy lately. In addition to speed tests, they also perform drop tests and publish various videos containing tips & tricks. Before moving on, you might want to take a look at this iPhone 8 vs. Galaxy S8 drop test. The specs of the iPhone X and Galaxy Note 8 are quite confusing and some might be tempted to declare the winner even before the start of this battle. While the iPhone X has just 3 GB of memory and the new Apple A11 Bionic SoC, the Galaxy Note 8 comes with a Qualcomm Snapdragon 835 and no less than 6 GB of memory. However, the results of PhoneBuff's tests reveal that the iPhone X can open a series of apps in just 1:15:28, almost 10 seconds faster than its competitor. 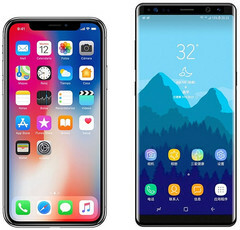 The second round tested the handsets' multitasking capabilities by reopening these apps and performing some quick tasks. This time, the Samsung handset needed 1:54, while the iPhone X had to spend 2:07. In the end, the Samsung Galaxy Note 8 won by a small margin. Since this test does not take into account the raw computing power or the gaming prowess of these two handsets, mobile gamers should look for in-depth reviews that cover these areas as well. What PhoneBuff did was to prove that opening quite a few apps and then reopening them is marginally faster on the Galaxy Note 8 than on the iPhone X.